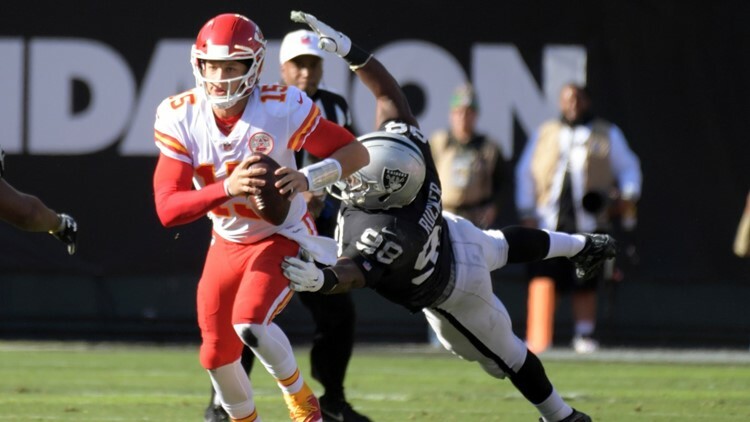 Kansas City Chiefs quarterback Patrick Mahomes (15) is pressured by Oakland Raiders defensive end Arden Key (99) in the first quarter at Oakland-Alameda County Coliseum. The Kansas City Chiefs won their first game since releasing star running back Kareem Hunt, 40-33 over the Oakland Raiders. OAKLAND, Calif. (AP) - Patrick Mahomes threw four touchdown passes Sunday to join Peyton Manning and Tom Brady as the only QBs to reach the 40 TD mark through 12 games. The Kansas City Chiefs won their first game since releasing star running back Kareem Hunt, 40-33 over the Oakland Raiders. The Chiefs (10-2) cut ties with Hunt after a months-old video surfaced on TMZ on Friday, showing him shoving and kicking a woman. No charges have been filed in the case from February, but the Chiefs let Hunt go because he misled them about the incident . Spencer Ware replaced Hunt as starter and scored on a direct snap on fourth-and-goal from the 1 in the third quarter. Mahomes did most of the rest of the damage against the Raiders (2-10) with his arm. He connected on two short touchdown passes to Travis Kelce in the first half, then found another tight end, Demetrius Harris, on a 13-yard pass late in the third quarter one play after an apparent TD to Kelce was called off by a replay review. Mahomes finished 23 for 38 for 295 yards and engineered a late TD drive capped by a 2-yard pass to Chris Conley after Oakland cut the deficit to three. Oakland added a late field goal, but the Chiefs recovered the onside kick to seal the win. Mahomes has 41 TD passes on the season, joining Manning (44 in 2004, 41 in '13) and Brady (41 in 2007) as the only QBs with at least 40 in the first 12 games of a season. Kelce had 12 catches for 168 yards, topping the 1,000-yard mark for the third straight season. Derek Carr threw three TD passes for the Raiders, but Oakland lost three fumbles that led to three scores for the Chiefs and reached double-digit losses for the 12th time in 16 seasons. The Raiders got on the board on Doug Martin's 1-yard run to cut Kansas City's lead to 13-7. But Mahomes needed just 57 yards to drive the length of the field. Demarcus Robinson had a 38-yard catch and raced across the entire width of the field to get out of bounds with 12 seconds left and the Chiefs having no timeouts. Mahomes then found Kelce for his second TD of the game on the next play. Arden Key blocked the extra point to keep the score 19-7. Oakland's Jared Cook and Kansas City's Eric Murray got into a scuffle late in the first half when they were jostling near the sideline well after the play. Both players were called for unsportsmanlike conduct on the play. The Chiefs got off to a rough start when Kelce lost a fumble on the opening play from scrimmage. It didn't hurt the Chiefs, who got the ball back when the Raiders were unable to get a first down and punted after Rodney Hudson was called for a hold on a fourth-down run. Martin and DeAndre Washington then lost fumbles for Oakland in the first half, leading to field goals for Harrison Butker. Oakland's other halfback, Jalen Richard, lost a fumble in the third quarter that led to a TD for the Chiefs. Chiefs: Host Ravens next Sunday. Raiders: Host Steelers next Sunday.